A watershed is an area of land where all of the water, such as rain, streams or groundwater, drain to a common place. Who lives in a watershed? We all do! The primary objectives of the WMP are to identify sources of land-based pollutants and develop actions to remediate them to reduce stress on coral reefs. Land-based pollutants include sediment, nutrients, and other pollutants that are transported in surface and ground water and deposited in the ocean. Pollutant sources are the result of a watershed’s land uses, its physical condition, and human activities. Watershed management is an inherently iterative process, requiring evaluation and adoption of new information and approaches as additional information becomes available. For example, in 2014 we learned that sediment sources in the stream and gulch banks and beds was a probable contributor of sediment to nearshore waters, and as such, became a new priority for management measures and further study. Project progress, funding allocated, new research and lessons learned through the end of 2014 are captured in the document below. 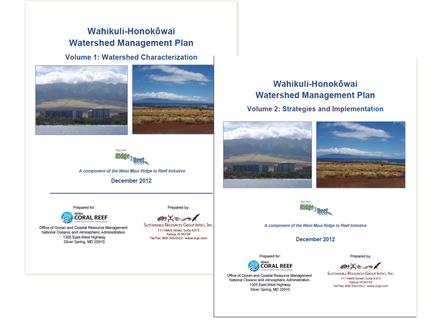 The Wahikuli-Honokōwai Watershed Management Plan is available below. Being an iterative process, as new information is available, the plan will be updated so that it continues to be a guide for understanding our watersheds and implementing pollution reduction projects. Vol.1: Watershed Characterization - Background information on the area (geology, soil types, land use, weather, previous studies etc.) and identification of location and type of land-based pollution contributing to reef decline (277 pages). Vol.2: Implementation and Strategies- Recommended priority actions, implementation, measures, monitoring, outreach and education plan (193 pages). Vision: Healthy and resilient coral reefs that support marine life and sustainable human use as a result of active watershed stewardship by businesses and the public, reducing land-based pollution in Kā‘anapali from mauka to makai. 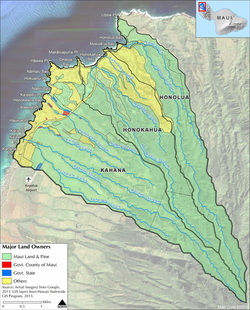 The purpose of the West Maui Watershed Plan: Kahana, Honokahua and Honolua Watersheds Characterization Report is to evaluate watershed processes and determine land uses and activities that may generate non-point source pollutants and alter hydrologic and ecological process in these three watersheds. This report is the first of two reports for the Kahana, Honokahua and Honolua watersheds. The Characterization Report provides the basis for the follow-on report, Watershed Strategies and Implementation Report, which will propose management measures to assist in mitigating land-based sources of pollutants that adversely affect water quality, and the health of the coral reef ecosystem. The second report will be released later this year and will also include a public comment period. Together the two reports for the Kahana, Honokahua, and Honolua watersheds and the previously published Wahikuli-Honokōwai Watershed Management Plan are part of the larger West Maui Ridge 2 Reef Initiative focusing management efforts across all five watersheds. These plans identify short term solutions to address land-based sources of pollution. The Draft Strategies and Implementation Report for Kahana, Honokahua, and Honolua watersheds is a follow-on report to the Kahana, Honokahua, Honolua Watersheds Draft Watershed Characterization Report released previously. The purpose of this report is to guide actions to restore and protect water quality and aquatic life in the watersheds of Kahana, Honokahua, Honolua.